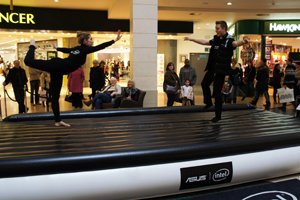 iD Experiential is giving visitors to Bluewater shopping centre the chance to try the extreme sport of slacklining in its latest campaign for laptop manufacturer ASUS. The 'Search for the Incredible' campaign runs until 3 March. It is iD’s third for ASUS, and focuses on slacklining, the art of balancing on a strip of webbing tied between two anchor points, similar to a tightrope. The experience in Kent’s Bluewater shopping centre is designed to engage consumers with the new ASUS product range, including the TaiChi, a fusion of a notebook and tablet. Expert slackliners will perform each day and coach consumers to try out the experience. They can also win laptop prizes and trial the ASUS products with help from brand ambassadors supplied by iD Experiential’s promotional staffing arm, iD Staffing.